The goal of this project is to build a PCR machine as part of the open biolab. The device should be simple enough that people with a basic skillset can build it on their own while being cheap and simple to produce in a 100x to 500x quantity. The current target for the entire kit is $500 (PCR, centrifuge, shaking incubator, gel electrophoresis box, micropipette + chemistry/biology/plastics for 3+ experiments). This may turn out to be too low for the first run, but we're aiming at making this as affordable as possible while maintaining a quality that's good enough for day-to-day citizen science work. Our initial prototype order. Based on aluminum block PCR tube holder. Does not include case. Pricing for between 100 and 500 units unit. Some prices estimated. Not including taxes and shipping. This is what will hold the PCR tubes. In commercial machines this is usually a block of with holes for the PCR tubes. The holes are usually only deep enough for about 50% of the PCR tube. 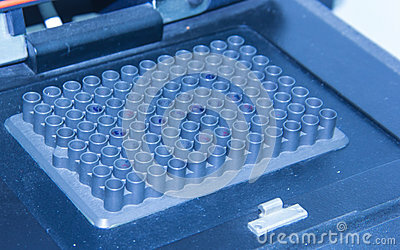 Note that many PCR machines have PCR tube holes that are much shallower than the height of a PCR tube. The curvature/slant of the bottom runs to about half-way up the tube. Where the PCR tubes are held in a holed piece of wood/plastic/metal. Aluminum has a high thermal conductivity and is easy to machine. Adding a chunk of metal will slow temperature change. This is not desirable for rapid cycling, but it will make it easier to ensure that the temperature at the temperature probe and the temperature in all of the the PCR tubes is the same. Using a holed sheet of metal and air heating/cooling would be cheaper but may be more difficult to control accurately. Milled aluminum has the problem that a custom-made drill-bit is needed to drill the holes for the PCR tubes. Hackteria has had a few of these made, and will send them to people to loan, but that's not quite as accessible as we would want. Another option is that people can just drill normal holes for the home-made version of the kit and then add a bit of mineral oil to the bottom of the holes to make contact between the PCR tubes and the block of aluminum. We should test how well this works. No special drill bit needed (more DIY friendly). Metal can be melted on a normal stove. RTV silicone mold is re-usable. Lower heat conductivity than aluminum. RTV silicone mold supplies are expensive. A sheet of metal with holes in it and a fan to circulate the air. Controlling the temperature accurately will require more dynamic control but we should try it and see what kind of temperature stability and ramp times we can get. DIP (through-hole) version is $2.88 but only $1.60 at 100x via digikey. No DIP version exists, but QFP version exists which sorta kinda is hand-solderable but not by noobs. Price is $3.37 at 100x via digikey. Cables based on the PL2303HX chip can be had for $3. Maybe slightly less if we buy in bulk. It would be nice to have minimum plus/minus 0.5 C accurate sensors. Digital is more expensive than analog for an equivalent accuracy, and prohibitively expensive at high accuracy. If we go with the cheaper analog solution then we may have to individually calibrate the sensors. Arduino ADC resolution is 10 bit, so if hooked up correctly we should be able to get better than 0.2 C accuracy in sampling. 2k ohm NTC thermistor via digikey for $0.72 at 1x or $0.37 at 100x. About +/- 0.5 C accurate from 0 to 50 C.
+/- 1.0 C at 75 C.
+/- 1.5 C at 100 C.
7.198 k ohm at -5 C.
0.111 k ohm at 120 C.
1k ohm NTC thermistor via digikey for $1.06 at 100x. +/- 0.2 C from 0 to 70 C.
We can likely get much better prices for high accuracy thermistors if we are willing to work with SMD components. +/- 1.0 at 25 C.
+/- 2.0 from -40 to 125 C.
Maxim DS18B20 at sparkfun for $4.25 or $3.40 at 100x. +/- 0.5 C accuracy from -55 to 85 C.
Range is -55 to 125 C.
Peltier element 40x40 mm at sparkfun for $15 or $12 at 100x. Could not find anything cheaper on digikey. It looks like searching for '12709 Tec' can yield small lots of a very very similar device for $5 a piece. I've been looking at the specs of some Peltier chips (see https://docs.google.com/file/d/1u2m--LONYCOyvcp76spoAP3wN3nWroROwfTtoJx9TpeeeMYY1WVNb1-KCXOk/edit?usp=sharing ) and on some of them, they seem to be designed for lower temperature operation and the lifetime of the device will be significantly reduced if you operate them at a high temperature (the limits of the device in the attached spec device, for example, is 80C.) At 95C, the hot side quickly ramps up from the cold side temp, which is starting at 95C, I've heard as much as 4x the rate of the cold side. By the time you got to 80C on the cold side, you could easily exceed 150C if your heat sink isn't able to pump that much heat that quickly. I think to ensure against damage or reduced life, you have to carefully control the amount of volatge/current applied. A feedback loop to limit applied voltage based on temp of hot side seems to be a sensible addition. I'm still trying to figure this out for a temperature controlled minielectrophoresis unit that I am designing (to be open source). Hbergeronx. Use "fire cement diluted with a little water" to hold the power resistor in place. source. The RFP30N06LE or FQP30N06L from sparkfun for $1 or $0.76 at 100x. Same price at digikey. This has a built in charge pump, which allows it to trigger fully from 3.3v. Used in some of the 3D printers for nozzle heater control, but not fully triggerable from 3.3v. 1 MOSFET for regulating heating element. 1 MOSFET for regulating peltier element. Each MOSFET needs a 10k resistor and a 1N4001 diode for about $0.30. Should be 5 or 12 vdc 5x5 cm. We should use standard CPU coolers since they are cheap an easy to find, which is important since this is the only moving part in the PCR machine and will likely need to be replaced at some point by the user. $4 fan from digikey - no heatsink included (drops to $2.90 for 100). $5 fan from sparkfun - no heatsink. We also need a transistor to control the fan. The digikey fan uses 0.8 watt and the sparkfun fan uses 1 watt. Assuming the fans are 12 volts, the NPN 2N3904 can be used (but it's max 200 mA) via sparkfun at $0.75 but they're less than 10 cents at 100x. 12v 10amp power supply $24, but can be used for centrifuge and incubator as well. 24-pin ATX PSU female connector and breakout-board for $7 total. Note: Comments moved to different section of this page: Temperature control -> Cooling. This page was last edited on 16 March 2013, at 21:46.